McConnell, W.H.. "Canadian Bill of Rights". The Canadian Encyclopedia, 23 December 2015, Historica Canada. https://www.thecanadianencyclopedia.ca/en/article/canadian-bill-of-rights. Accessed 22 April 2019. The 1960 Canadian Bill of Rights was the country’s first federal law to protect human rights and fundamental freedom. Considered groundbreaking at the time, it was eventually superseded by the 1982 Canadian Charter of Rights and Freedoms. Prime Minister Diefenbaker displaying the Bill of Rights of 1958 (D. Cameron/National Archives of Canada/PA-112659). 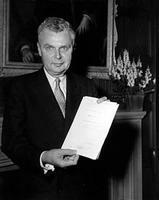 Conservative Prime Minister John Diefenbaker introduced this path-breaking 1960 human rights Bill. Its preamble says the Parliament of Canada, “affirming that the Canadian Nation is founded upon principals that acknowledge the supremacy of God, the dignity and worth of the human person and the position of the family in a society of free men and free institutions,” also affirms that “men and institutions” remain free only when freedom is founded on respect for moral and spiritual values and the rule of law. The Bill, still in effect, applies only to federal laws and government actions because the requisite provincial consent was not obtained. It recognizes the rights of individuals to life, liberty, personal security and enjoyment of property. It does not recognize "possession" of property, since that is a matter of provincial jurisdiction. Being deprived of these rights is forbidden, "except by due process of law." It protects rights to equality before the law and ensures protection of the law; it protects the freedoms of religion, speech, the press, and of assembly and association; and it guarantees legal rights such as the rights to counsel and "fair hearing." Laws are to be construed and applied so as not to detract from these rights and freedoms. One of the Bill's weaknesses was that many judges regarded it as a mere interpretive aid. Section 2 provides that Parliament can override the mentioned rights by inserting a "notwithstanding" clause in the applicable statute. This was done only once, during the 1970 October Crisis. Although the Bill remains in effect, many of its provisions were superseded by the 1982 Canadian Charter of Rights and Freedoms. The Charter is not only a much broader human rights law, it has greater power because it applies to provincial as well as federal laws and actions. And unlike the Bill of Rights, the Charter is part of the Constitution—the highest law of the land. See also Drybones Case; Lavell Case. Canadian Charter of Rights and FreedomsA detailed guide to Canada's Charter of Rights and Freedoms and related issues. From the Department of Canadian Heritage.